Preheat oven to 375 F. Rub potatoes with canola oil and place on baking sheet. Bake for 1 hour or until very tender. Combine butter, cream cheese, brown sugar, and spices. Slice potatoes, and slip out of skins. Mash. Combine butter/ cream cheese mixture with mashed potatoes, and serve hot. That sounds divine! 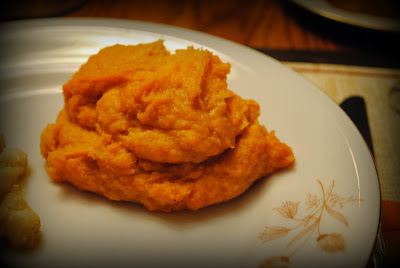 We like sweet potatoes and I have been looking for more recipes!